Open-arched filigree and milgrain trim highlight the 18k white gold band of this vintage style blue sapphire engagement ring. A collection of twenty princess and round brilliant cut diamonds cascade down the shoulders and accentuate the shank. The combined weight of all the diamonds is 0.50 carats. An round blue sapphire ascends from the center of this diamond shimmer. 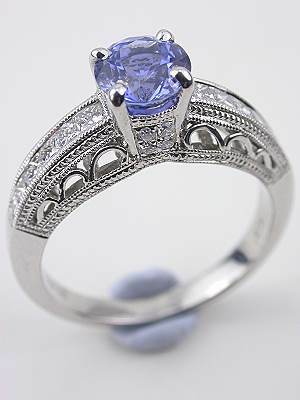 This is a new filigree and sapphire engagement ring. Diamond accents stretch their arms wide to caress a 1.06 carat white sapphire. Like a pinwheel twirling in the breeze, this vintage inspired engagement ring abounds with frolic and fun. The loop prong mounting that cradles the white sapphire boasts a modern split shank. Branching out from these prongs are diamond accented Y-shaped shoulders. Details: Vintage Style. New. 18k white gold. Round brilliant cut diamonds; 0.23 carats. Round brilliant cut white sapphire; 1.06 carats. 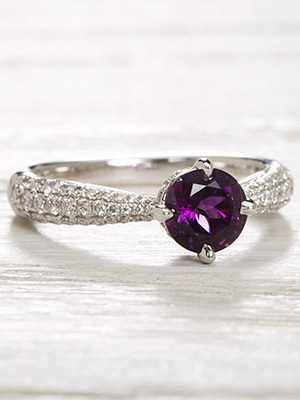 Diamond-dusted arrows point attention to this engagement ring’s bewitching amethyst. Like violets pushing through winter's newly unfrozen earth, this amethyst engagement ring blends the beauty of two seasons. The round amethyst glows with vivid springtime color. Reminiscent of ice crystals, diamond accents drip like icicles and prismatically radiate light down the shoulders of the polished band. Details: Vintage Style. New. 18k white gold. Round brilliant cut diamonds; 0.49 carats. Amethyst; 0.77 carats. 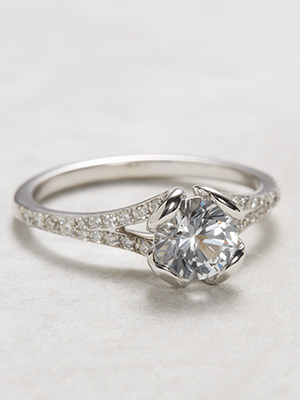 Spun like an angelic halo, a mix of diamonds adds angelic shimmer to this vintage inspired engagement ring. A streamer of diamonds flutters up the shoulders of this vintage inspired ring, culminating in a halo around the focal point tourmaline. This centerpiece green gemstone is flanked by a pair of straight baguette cut diamonds. Details: Vintage style. New. 18k white gold. Round full cut and straight baguette cut diamonds; 0.5 carats. Round tourmaline; 0.75 carats. 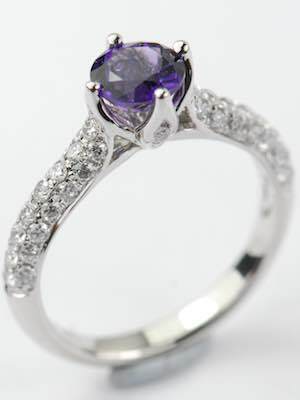 Diamond-dusted lavender fields come to life in this vintage style engagement ring with amethyst. This vintage style engagement ring brings to mind the French countryside and its fragrant fields of lavender. The round amethyst that is cradled in the center is flanked down the shoulders with a collection of round full cut diamonds. An 18k white gold band provides a shimmery yet understated setting. Details: Vintage Style (New). 18k white gold. Round full cut diamonds; 0.59 carats. Round amethyst; 0.76 carats. Lacy silken threads wrap the finger in radiance with this Edwardian inspired antique style engagement ring. In this antique style engagement ring, a platinum band with open cutwork down the shoulders lends a tonal backdrop to the fifty-eight round full cut diamonds that accentuate it. A GIA-certified round brilliant cut diamond serves as the piece de resistance in this Edardian inspired engagement ring. This G-colored, SI1-clarity diamond centerpiece weighs 1.22 carats. The combined weight of all the diamonds is 1.72 carats. 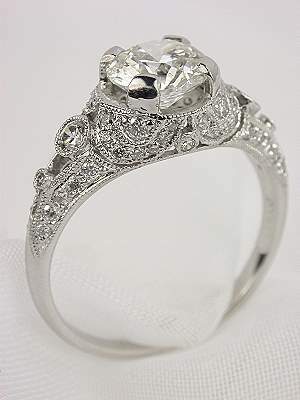 This is a (new) antique style engagement ring. 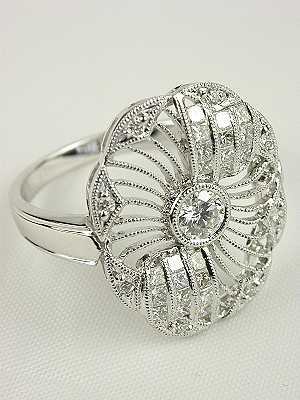 Vintage style engagement rings like this one are mesmerizing with their unusual beauty. The horseshoe-shaped 18k white gold band of this vintage style engagement ring rises at the top to embrace a 0.87 carat GIA certified round brilliant cut diamond. 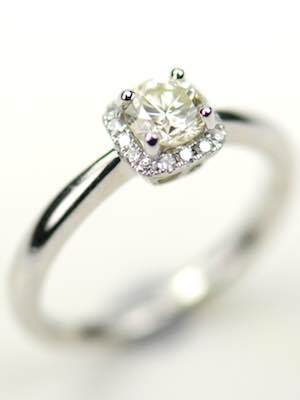 Diamonds also adorn the top of each of the 4 prongs which hold the center diamond. 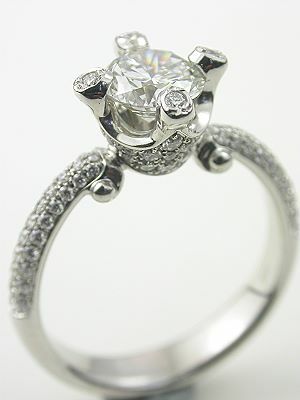 An additional 90 round full cut diamonds twirl around the center stone and cascade down the mounting and shoulders. This is a vintage style (new) engagement ring. This elegantly simple engagement ring is from the Topazery Earth Collection. In this vintage style engagement ring, a halo design mounting cradles a GIA certified 0.50 carat round brilliant cut diamond with the soft color of candle light. This romantic focal point diamond is encircled by a collection of sixteen round full cut diamonds. The 18k white gold band of this engagement ring is polished to a smooth sheen. This is a vintage style (new) engagement ring. Declare your love for her with this rose gold and diamond heart shaped promise ring. A heart-shaped mounting and an 18k rose gold setting join forces to lend the ultimate in romance to this promise ring. Nestled in the center of the heart is a round brilliant cut diamond. This 0.27 carat diamond solitaire is H in color and SI1 in clarity. 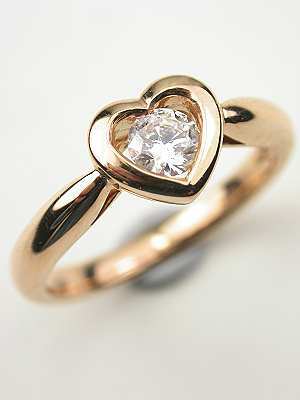 This is a new diamond and heart promise ring in rose gold. 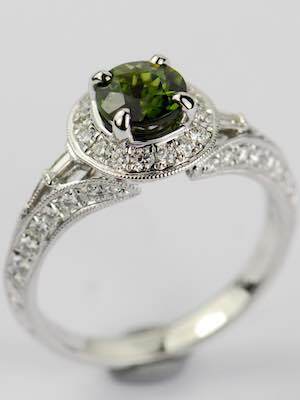 In this Topazery Earth Collection engagement ring, a green tourmaline is held afloat by a stream of diamonds and loops. 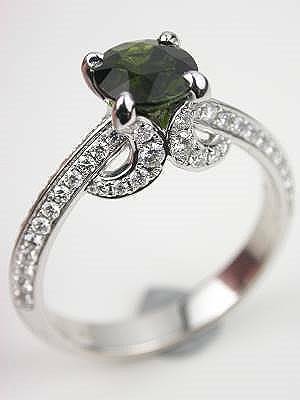 The round tourmaline that is set in the center of this engagement ring radiates with 0.77 carats of dark green intensity. The 18k white gold band playfully seduces the centerpiece gemstone, with conjoined loops that embrace it. These loops as well as the shoulders of the band are accented with a collection of seventy-two round full cut diamonds that total 0.46 carats. This is a new engagement ring from the Topazery Earth collection. This heart motif antique style ruby engagement ring embodies the spirit of fire and ice. A round faceted mixed cut ruby is set at the center of the 18k white gold band of this engagement ring. This gemstone, which weighs 1.65 carats, is inside a romantic heart-motif bezel. A collection of 48 round full cut diamonds cascades down the shoulders of the band. The diamonds have a combined weight of 0.41 carats. 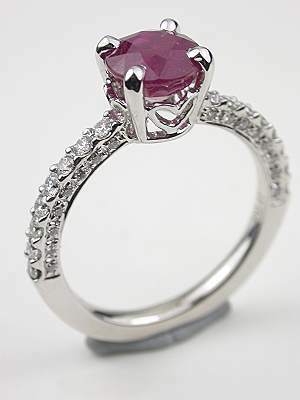 This is a new ruby engagement ring from the Topazery Collection. A delicate pink rose bud is just beginning to open in this chic vintage style ring with rose petal motif. 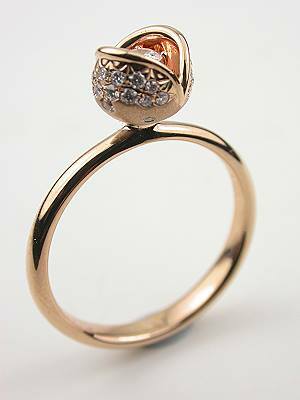 Overflowing with romantic femininity, this unique vintage style ring is done in 18k rose gold. The rose bud is set with a collection of thirty round brilliant cut diamonds. Tucked in the center of the unfurling petals is a larger round brilliant cut diamond that weighs 0.08 carats. TThe combined weight of all the diamonds is 0.21 carats. This is a new vintage style jewelry piece. All the stars are aligned in a perfect circle of light in this antique style diamond ring. The open design of this antique style engagement ring lends a lacy, airy feel to the finger. A round full cut diamond is set at the center of the 'Circle of Light' with thirty princess and round full cut diamonds accentuating its outer arc. The total diamond weight of this 18k white gold antique style ring is 0.54 carats. This 'Circle of Light' diamond ring makes an unusual Right Hand Ring or engagement ring.